Look south to southwest this early evening to view the waxing crescent moon. The moon’s disk is nearly 40% illuminated by sunshine and 60% engulfed in its own shadow. 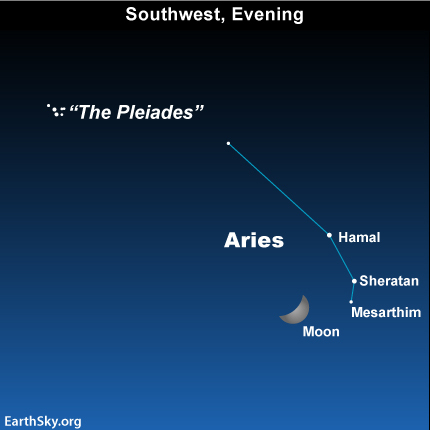 Tonight, the moon shines near the three brightest stars of the constellation Aries: Hamal, Sheratan, and Mesarthim. 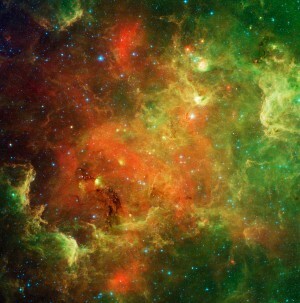 Half the moon is always illuminated in space. In other words, the moon has a day side and a night side, just as Earth does. Due to the angle between the sun, Earth and moon tonight, we are seeing a little less of the moon’s day side than its night side. The part of the moon that is not in sunlight is often called the moon’s dark side. Just realize that – because of the moon’s motion around Earth – the portion of the dark side that we see from Earth constantly changes. There is a permanent far side of the moon. But there is no permanent dark side of the moon, because any given lunar location experiences night for about two weeks, followed by daylight for about two weeks. Does the dark side of the moon really exist? The moon does rotate on its axis. But billions of years of Earth’s strong gravitational pull have slowed it down such that today the moon takes as long to rotate as it does to orbit once around Earth. Astronomers would say that the moon is tidally locked with Earth. For that reason, one side of the moon always faces Earth, but it is not always dark … as you can see just by looking at the sky tonight. Incidentally, the moon’s gravitational effects on Earth are much smaller, but, given billions of years of time, the Earth will slow down and keep one face always toward the moon.